My sister Janice and her husband Rick came for a visit this weekend and we all had a wonderful time. Once again its hay season, so Sonny and Rick helped John put up bales of hay. 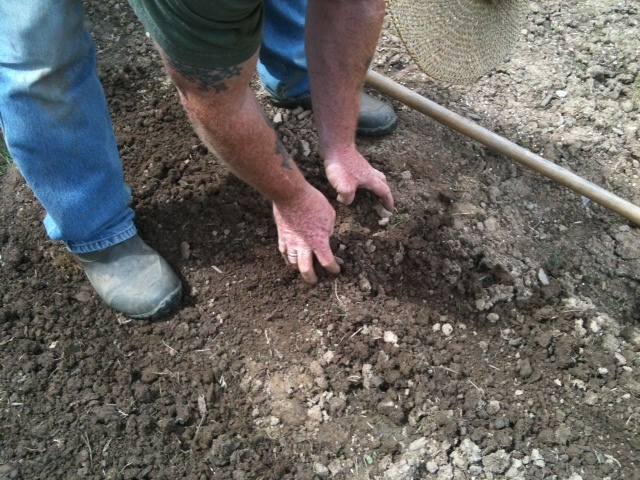 Its a busy time here in the country and its about to ratchet up another notch as soon as the garden is ready to harvest. There are already wild black raspberries coming into season and that means its time to pull out the jelly jars, lids and bands. The buckets are sitting on standby and Janice and I have already picked a few ripe juicy ones that sweetened our taste buds. Sonny recruited Janice as his bee keeper assistant. Suited up in bee gear she smoked the bees while he checked for honey. The wooden frames covered in wax were full and ready to be harvested. Liquid gold filled each pocket of honey comb. 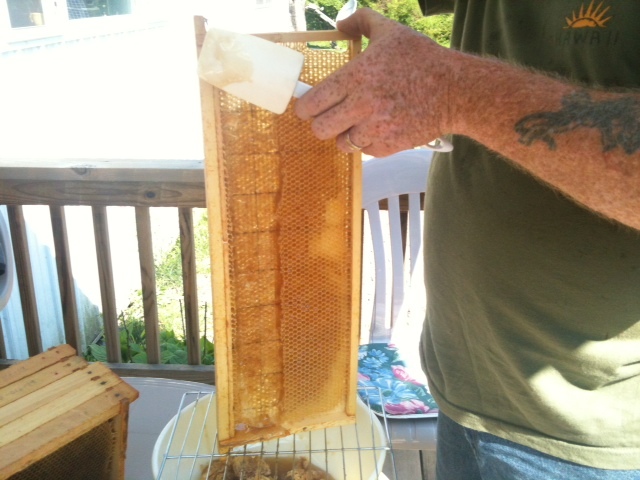 Sonny scraped the frames then we squeezed out the honey through a sieve and then filtered out any remaining debris. 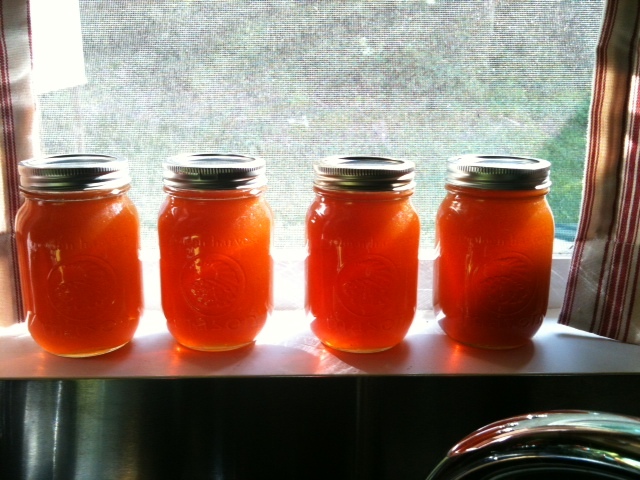 We harvested a little over two quarts. The bees have been busy collecting pollen from the clover and wildflowers that grow in abundance here at the farm. Our honey has all the sweet flavors of these fragrant wild flowers and is a light golden hue. This is a small batch and most of our honey will be distributed to family members but we may be able to keep aside a few ounces if anyone is interested in purchasing a sample. You can leave a comment or email. Our plan is to order some more bees and start another hive. Hopefully we will have plenty of honey next year. A few months ago, while at the still ripe old age of fifty-one, Sonny decided that it was time to retire from the outside work force and become a full time farmer. We had been planning for this event for a few years by gradually paying off all our bills. My father’s advice to us has always been to make sure that we were debt free before retirement. That is exactly what he did when he retired at the age of fifty-six back in nineteen-seventy-nine and it has been good advice. When we told people what our plan was we had a mix of opinions, everything from “Are you sure you want to retire? What are you going to do all day? Your too young to retire and your gonna miss those big paychecks your getting.” Others had a more positive view of our plan and gave us full support. There were a few that wished they could do the same thing. I have asked him if he misses his job. He replies with an emphatic “NOPE!” Are we sitting around eating bonbons and watching TV? NOPE. We are always busy and on the move. Every season on the farm will have its busy times. Spring is planting and maintaining the garden, late summer is canning and preserving, autumn is winter preps and firewood cutting and late winter is maple season. We also have the care of critters and beekeeping. We still hope to have a few goats by next spring, which brings us to putting up fences. There are always projects, something to be built, something to be extended, something to be repaired. We eat when we want to, take a coffee break when we want to and sleep when we want to. Life is so very short. Time speeds by us leaving memories in its wake and we wonder where it all went. Sonny could have kept working. We could have had a bigger house, more money in the bank and more stuff. He could still be traveling the world with stress as his constant companion. But when is enough…enough? Were we a little scared to take the plunge? Yes, but we found that the leap was not as high because we were prepared. We now live on a tight budget, but lack nothing. We awaken to the morning songs of birds instead of a blaring alarm clock ( unless we are going to the flea market on Saturday morning and have to get up at five o’clock). The point is, we wanted to be able to provide for ourselves and enjoy life’s simple gifts before one of us became ill or too old. That is our dream and God willing we will have many years to come. Others may want to travel like my parents did or pursue their artistic skills. Its up to you. Sometimes you have to take stock of what is truly important. Everyones circumstances are different, and if you have to keep working the nine to five at least stop and smell the roses or whatever your favorite past time might be. In the words of Sonny, “Everyday is Saturday.” Pursue you dreams while you can. You are currently browsing the Off-Grid in West Virginia blog archives for June, 2012.